The area of concern to our general aviation community is the loss of ramp space the area designated as P4. 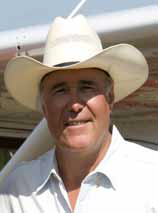 This action would eliminate approximately 25 general aviation aircraft tie downs and convert the space to motor vehicle parking for the next 30 years. It also means demolition of the old Jet Deck building which has become more of a liability than an asset to the airport. Many of us who used to meet at the Jet Deck after a day of flying or working on our airplanes miss the Jet Deck but sadly it’s time has passed but we would still like to see a restaurant somewhere on Paine Field again. I had a very cordial meeting with Ryan Zulauf, Deputy Director – Maintenance & Properties at Paine Field on this whole subject recently. Ryan previously worked at the FAA and was previously the Renton Airport Director. We were also joined by our old friend, Dave Waggoner who is back at Paine Field for a couple of months as a consultant. Arif Ghouse, Airport Director, greeted us as we entered the conference room and joined us for part of the meeting. 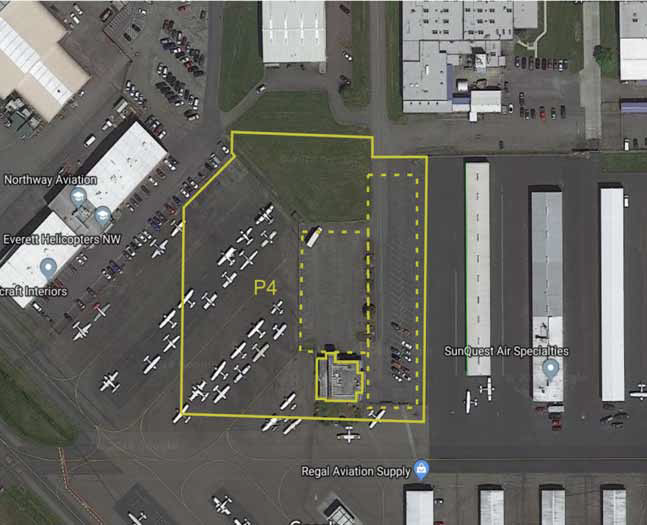 The Paine Field airport management’s point of view is that the 25 or so displaced aircraft in the P4 area can be relocated to other places on Paine Field. My own analysis of the airport GA tie down use (based on satellite photos) suggests that the displaced aircraft could still be tied down in the central area between the two parallel runways. This displacement would however use up most of the available tie downs in central. The east side of runway 34L/16R currently has a large surplus of aircraft tie down locations. This is an undesirable tie down area as there are no public restrooms in the area and no motor vehicle access to airplanes. The open space on this side of the airport will also be reduced significantly when Regal Air builds a new FBO building there along with the required customer and employee parking. I think we should welcome this change as it will be a good move for both the airport and Regal Air. While this is an ideal location for a FBO that would serve general aviation it is not clear how many aircraft tie downs will be available on the east side after the Regal Air move. Our airport staff indicated that there are about 550 airplanes based at Paine Field. Approximately 80 of those airplanes are tied down outside. The real question is whether or not there is any room for general aviation growth at Paine Field. The airport has about 278 hangars that can store typical general aviation airplanes. There are 63 large hangars in the West Condos and 80 smaller hangars in the East Condos. There are an additional 22 very large hangars in the North Corporate complex. 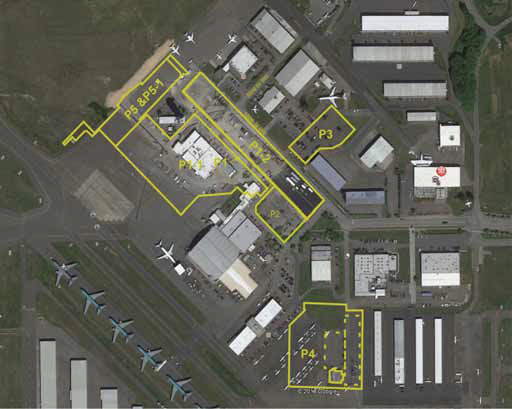 In all there are 443 GA hangars at Paine Field and many of them could store more than one aircraft. All of the hangars at Paine Field are full and there is a substantial waiting list of people who would either like to move their airplane to Paine Field or move from a Paine Field tie down into a hangar. I started flying out of Paine Field in 1984 and soon I became an aircraft owner. A that time hangar space was impossible to obtain and I waited over 2 years to rent a hangar in the West County hangers. I few years later I was involved in the development of condominium hangers on the west side of Paine Field. Today many of these 63 hangars are housing multiple aircraft. The condominium hangers on the east side of runway 34R/16L were developed a short time later. Following this Paine Field decided to build additional hangars. With all of this construction you might think that there are enough hangars at Paine Field to meet the demand but there is still a long waiting list to rent a hangar at Paine Field. If the airport decided to build more hangars they would likely be spoken for before construction started. Dave Wagner used to refer to Paine Field as “the airport of choice” and I could not agree more. It has great runways with multiple instrument approaches, several FBOs providing flight training, fuel and other aviation services. It is also located within a major urban area so it serves a large community. 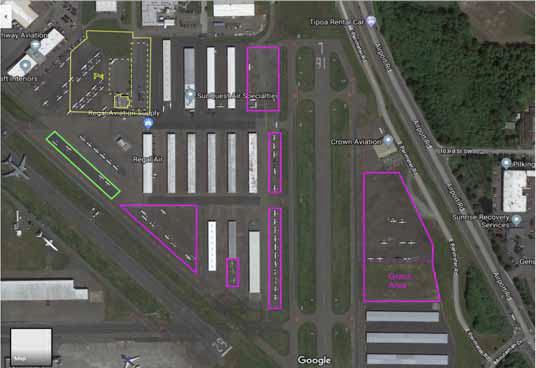 When we look around Paine Field there is very little space left for general aviation aircraft parking and/or additional hangar construction. (See pink outline areas below. The green area is transient aircraft parking.) The largest area on the east side will be reduced significantly when Regal Air builds a new facility along with a parking lot to serve employees and customers. For those who might think that there are possibilities for development on the west side of runway 34L/16R I will agree that such possibilities exist if you happen to own a Boeing 737 Business Jet or a Gulf Stream 5, etc. Much of this area will be very expensive to develop due to the significant grade down to Mukilteo Speedway. There are a few areas left that could be utilized to build GA hangars. In the development of a revised airport master plan (possibly next year) there needs to be a discussion regarding the relative value of runway 11/29. Boeing currently leases this space probably won’t occupy it forever. If runway 11/29 were closed permanently there would be more space available on the airport. If this were to pass then what would be the best use of this airport land? There are many questions that need to be answered in the next revision of the airport master plan. 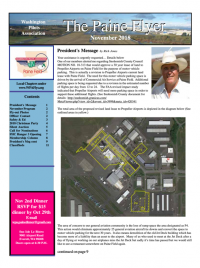 In reading this month’s Presidents Message some of you in our GA community might start seeing the airport administration as our “enemy” rather than our friend. I think a more appropriate point of view is to see the Paine Field Airport Administration as the mediators between all the separate but appropriate aviation interests on Paine Field. In a mediation process the participants seldom get everything that they want. The airport need to hear from the GA community as well as the many other airport users. It would be very appropriate to provide thoughtful comments regarding Snohomish County Council MOTION NO. 18-3 per item 1 below. You may also wish to participate in the public hearing on October 29 2018 per item 2 below. Public hearing on Oct. 29, 2018 at the Lynnwood Convention Center, at 3711 196th St SW, Lynnwood, WA 98036, from 5:30 p.m. to 8:30 p.m. I am not opposed to Propeller Airports developing commercial air service at Paine Field. Nor am I opposed to the expansion of their footprint on Paine Field to the extent that it does not displace aircraft and reduce the precious space that provides access to Paine Field’s runways. If the parcel described by EXHIBIT P4 of the proposed lease agreement must be given over to Propeller Airports in order to support commercial aviation at Paine Field then I think we need to engage the airport administration in discussions regarding opportunities for meeting the obvious pent up demand for GA hangars at Paine Field.